Come and meet writer/blogger/ artist Lisa Borgnes Giramonti and celebrate her style, her talent, and her great blog A Bloomsbury Life. 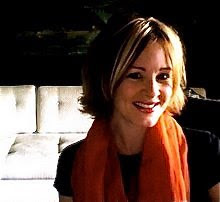 Los Angeles based Lisa Borgnes Giramonti, who is famous throughout the world for her fabulous blog A Bloomsbury Life, was one of the first bloggers I ‘friended’ and one of the very first on my favorites blog roll when I launched THE STYLE SALONISTE June 2009. 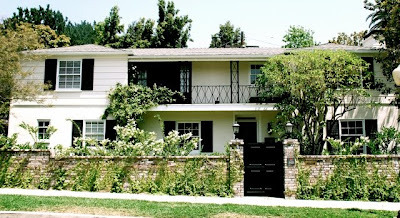 Lisa lives in Los Angeles with her husband, Piero Giramonti, a music executive, and their young son Luca. Lisa writes warmly and philosophically about their day-to-day life, their travels (Morocco, London) and Lisa’s adventures in design, reading, and musings on books and ideas. Lisa and I often email back and forth, swap ideas and inspiration, and soon after we ‘met’ on our blogs we were exchanging and gifting favorite books. For the last few months, Lisa has been telling me, with great excitement (and fervor and impatience) about her upcoming show of her post-modern embroideries. Every moment of the day that she was not blogging or making Luca’s lunch, she was stitching and designing and embroidering. Lisa’s embroideries are completed, they are about to be framed for the show, and any moment now (early May) friends will crowd into a Los Angeles gallery to celebrate her talent, charm, originality and humor. 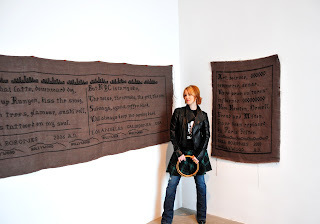 Lisa in March 2010 with her newly completed (and not yet framed) samplers, ready for her show. Each will be carefully framed. Lisa, whose three-year-old blog ‘A Bloomsbury Life’ is read avidly by thousands of enthusiasts around the world, has a secret second life as an artist/embroiderer. 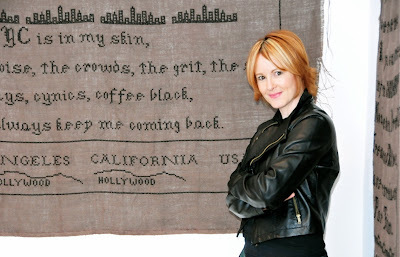 Lisa will be debuting her newest large-scale embroideries in her first solo exhibition, ‘Stitching up the Noughties’ at Acme gallery in Los Angeles this month. 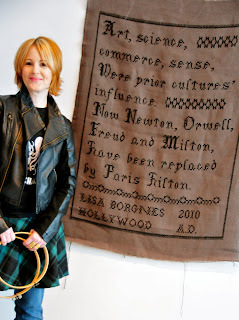 In these wise and edgy framed post-modern art works, sewn artfully in silk embroidery floss on burlap, she comments in black cross stitch on celebrity, beauty, tabloids, Botox, plastic surgery, travel, literature, and modern life. 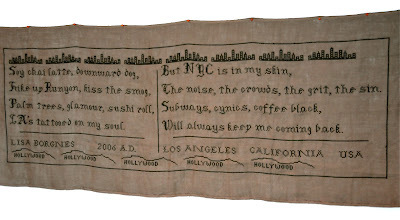 Exhibit open from May 1–29, Acme, 6150 Wilshire Boulevard., Los Angeles, 323-857-5842. Turned my savings into nada. Now what on my shoulder goes? An eco bag from Trader Joe’s. “I have always been fascinated with embroidery; my mother and grandmother were huge stitchers. What never appealed to me, however, was following a pattern. I wanted to sew my own life, my own obsessions and my own truths. I taught myself traditional methods of embroidery and then used them as the medium to bring my thoughts kicking and screaming to life. 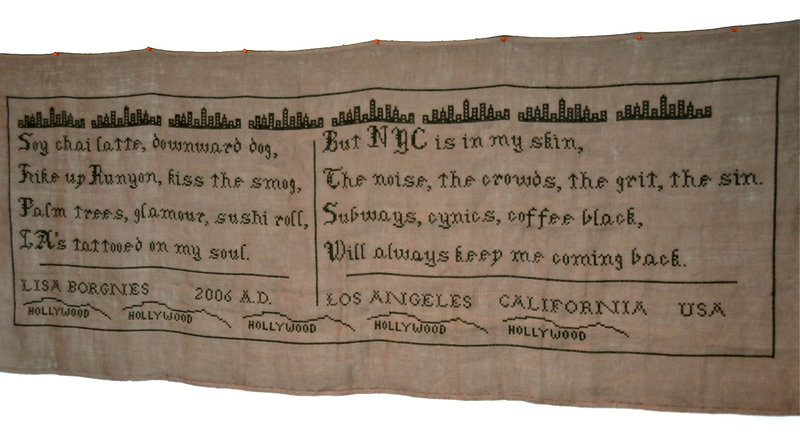 “I stitch onto burlap instead of fine-weave linen or cotton because the coarseness of the fabric feels modern to me and I wanted to use a fabric that visually felt a bit confrontational. My samplers aren't dainty little creatures under glass; they're not shy or retiring. Plus, the loose weave of burlap gave me the freedom of scale I was looking for. I think of my pieces as being “exploded” in the sense that they're blown up in size and freed from the limitations of historical subject matter. Los Feliz scriptwriter Lisa Borgnes Giramonti launched her deliciously eccentric and addictive design blog, A Bloomsbury Life, and it’s rapidly become a sensation on the design blog scene. Lisa and Piero’s house in Los Angeles. 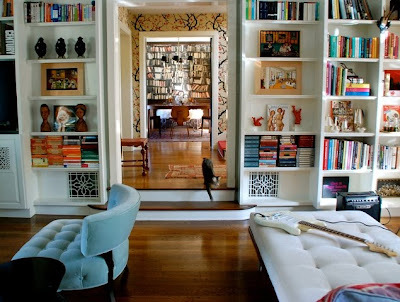 Readers of A Bloomsbury Life know every book, every chair, each nook, and every shaft of sunshine that streaks into the rooms. They also know the garden, pool, cat, breakfast rituals and dinner parties. Style fanatics check three times weekly. They avidly follow her musings and peregrinations on décor, happy domesticity, art, interiors, rare books, exotic travel, Bloomsbury life, and the joyous process of discovering style inspirations from the past. After living in London, Lisa and her husband moved to Los Angeles six years ago. Lisa worked on scripts for Will & Grace, then wanted to fall in love with writing all over again. “I wanted to discuss life in Los Angeles, Cecil Beaton, Edith Sitwell and Dora Carrington with like-minded fans,” said Lisa. Lisa and her life-long friend, Belinda Carlisle of the Go-Gos at their annual Christmas lunch in London, 2010. 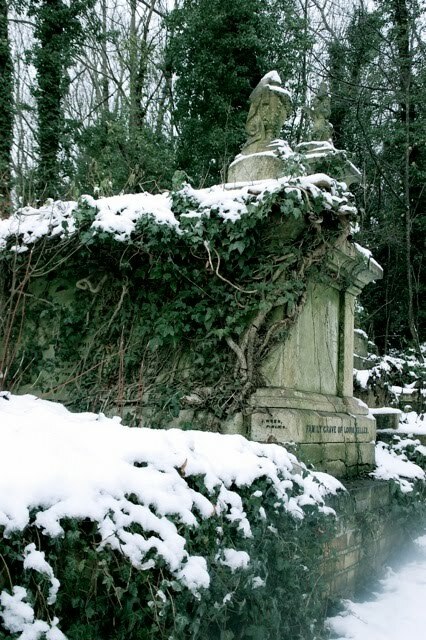 Highgate Cemetery in London—the scene of a snowy trip for Lisa and Belinda last Christmas. Empiric, 7918 Beverly Boulevard, Los Angeles, www.empiricstudio.com, 323-634-7323. Superchic owners, antiques, quirky and eccentric pieces, vintage industrial sensibility. Govinda's Imports, 3764 Watseka Avenue, Culver City, 310-836-1269, www.harekrishna.com. Indian textiles for decorating, incense, glorious summer tops, vibrant silk embroidered kurtas. Ivanhoe Books, 1618 Silver Lake Boulevard, Los Angeles, 323-660-1500. www.ivanhoebooks.com. Lucy Spriggs’ hidden gem, rare books, a lovely hidden place for browsing and discovery. 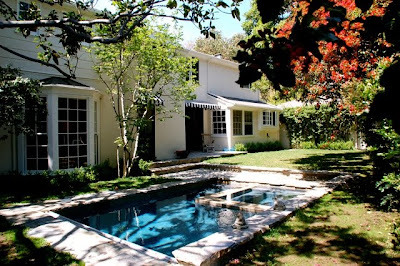 Rose Tree Cottage, 801 S. Pasadena Avenue, Pasadena, 626-793-3337. www.rosetreecottage.com. Classic Brown Betty teapots, Aga stoves, books on English style. Children's playdate for my son Luca, 7, and his friends. In the miniature Narnia of our garden: teacakes, mint tea and lemonade, mini sandwiches, and toasted banana bread with Nutella, followed by croquet and badminton. Exclusive photographs of Lisa with her (about to be framed) new art works, by Olga Roth. All other photographs courtesy of the Borgnes Giramonti family. Thank you to Lisa and to Piero (who took the fabulous photo of Lisa and Belinda Carlisle enjoying Christmas lunch in London, 2009. Bravissimo. How enchanting! Lisa is beautiful, talented, witty, wise, engaging...thanks for the insight into A Bloomsbury Life! The embroideries are priceless! She is so fierce! I wish she could bottle that, I'd be the first in line. She's just such an incredible gal! Love Lisa, her blog and her embroidery!!! smart, pretty and talented- love that lisa! looking forward to her show @acme! Thank you Diane! I am one of the many fans you are talking about here! Lisa is such a talent in so many arenas...not the least of which is her warm ability to befriend on sight a visitor from the North. I had the very good luck to meet her a couple of weeks ago, and she is as charming in person as she is on her fab blog! 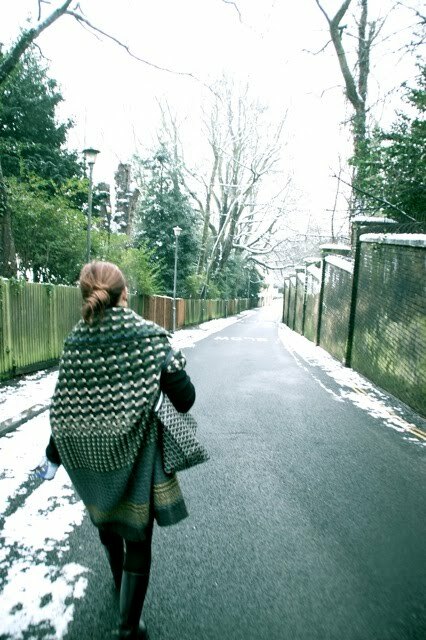 Whenever I read her blog, I feel like I have my nose pressed up against the window of a magical scene, a vivid painting or play, not quite real, almost a fantasy of sorts. It's wonderful! Hooray! A wonderful profile - wish I could see the show in person. I've been wanting to see more of Lisa's work and you have done a good job with this preview. Oh to be on the west coast to see it in full and in person. What a delightful profile. 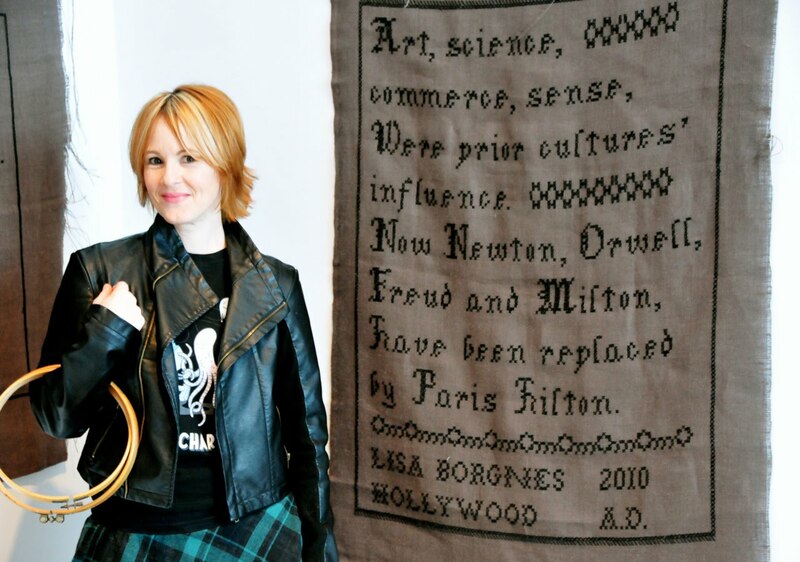 Lisa's posts are infused with humor and whimsical everyday life along with her fabulous sense of style. And thanks to her- my book list is growing weekly. I really love that she is self-taught and has such a way with words as well as the needle. I have admired Lisa from a distance and do hope to have the honor of meeting in person before she is a celebrity in her own time and place. I have been waiting for these embroideries! You did a wonderful job of highlighting Lisa's many talents and made me admire her even more. Thanks! I don't know what to say. I'm touched, tickled and overwhelmed...! Thank you for this lovely, lovely post. We know who we are! We all love Lisa--and I'm so glad we met. Thank you for heartfelt and intensely wonderful comments. Lisa's was one of my most admired blogs from the early days--even before I knew what I was going to do in the blog world. I launched THE STYLE SALONISTE and before a minute had passed, she and I were exchanging books. 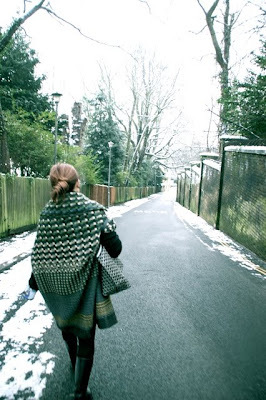 We all followed her to London and Morocco. The thing is--Lisa and I have not yet met, through we've tried and chatted about that. We will. So==I am thrilled to bits to hear from all of you. Stay in touch--and Lisa will be getting all kinds of great press (LA Times etc) and she will sell all of her samplers, and she will do something even more brilliant. Cheers to all of you--all my favorites and all the bloggers I love to read and see what is on your mind. Note that everyone said 'Lisa has great energy'. cheers to you all, and a million thanks for your wonderful comments. Bravo! Thank you for saluting this uniquely talented voice. I'm a devoted fan of A Bloomsbury Life, and echo the sentiments posted. I too became addicted with the very first post I read! I was mesmerized by her writing and insights. And, that would have been enough...but to hear and see the artistic talent is nothing but a very happy surprise!!! Oh, to own one of those works! I have been following Lisa's blog for just 2 months now. What I really like about her writing is that it is so thoughtful. to say something with them as well as making then harmoniously decorative, makes them all the more alluring. Thank you so much for your wonderful and vivid comments. Love them. I like Leslee's comment that Lisa's poems are 'savvy and terse'...and they are. I like the irony of her work--which is rather in contrast to the warm and charming and lovely 'reports from the homefront'...of her weekly stories. Cheers to Lisa--and I and I know all of you wish her great, great amazing success with her upcoming show. I wish her every happiness. Onward and upward! Thanks, Diane, for featuring Lisa. She is indeed one of a kind. Her style, her personality, her talents, and her mind are incredible. I wish her much success! Hooked on Lisa from my first glance. Another commenter mentioned having her face pressed against the window. So true! When I get an update alert...I get giddy. It's a ritual I treasure-thanks Diane for such a TERRIFIC post on my FAVORITE blog(ger)! Diane, This is so fascinating what an exciting talented and unique woman. I absolutely love her Samplers, thank you so much for sharing with us! What a marvelous post on Lisa, she has such a great sense a style! Love her embroidery. Just found your beautiful blog and will be following along. I loved this post so very much! Lisa is such an inspiration and what I'd give to see that exhibit in person --- let alone own a piece of her work! She's incredible and such a talent. Great, great profile of such a spectacular woman. What an astonishingly wonderful profile and richly deserved. Lisa encapsulates all that has been lost in modern life -- dedication, patience, resourcefulness, ingenuity, aesthetics, originality and soulfulness -- all from her magical Lilliputian wonderland. While her loveliness as a spirit and artist are evident, I am most drawn to her insurgency. It is her philosophy that sets her apart. How can you not help but embrace someone who works in burlap, lovingly rendering it with style and subversiveness? What a beautiful tribute to such a talented lady. I love Lisa and her blog. Nothing else out there compares! Diane, you've done a wonderfully fitting tribute to Lisa and have given us another glimse into her very special, charming world. She imparts culture, beauty and wit to us all and now we know her just a wee bit more thanks to you! I wish Lisa much success with her "slow art", she deserves it! Thank you for giving Lisa the props that she so deserves!! I LOVE reading about her talented, wonderful life!! Lisa's blog is one of my favorites--and she is kind and lovely in answering each and every comment left for her. Your responses and thoughts are vivid, vibrant, generous, heart-felt, wonderful--and uplifting. I am so thrilled to hear comments like those of Vava...that when you get an update...you feel 'giddy'. Love this. I also like Errant's comments__'Lisa offers dedication, patience, resourcefulness, ingenuity, aesthetics, originality and soulfulness -- all from her magical Lilliputian wonderland." ..and these comments speak for all of us, I believe. I like also dear readers who speak of Lisa's ability to take them out of the everyday, lift them from daily 'strife'. This is a fantastic tribute to Lisa, I feel. I hope you will all cram into the gallery in Los Angeles for her opening party--and spill out into the sidewalk and the parking lot. At least...for those far away...come in your dreams and send Lisa your very best wishes and thoughts. Thank you so much to all of our friends for such warm and witty and brilliant comments. Interesting work. Like the scale and graphic nature, but they are still warm. Cool juxtaposition. I am new to your blog (and habitually, always late to the party), nevertheless, I feel another tribute is due here. That would be to you for your incomparable generosity of spirit. It is small wonder that Lisa would feel "speechless." Your enthusiasm, warmth and kindness is as exceptional as it is contagious. You inspire and commend without pretense or artiface, just pure uninhibited joy -- a rare gift, indeed. Now I'm blushing. Thank you so much. I love all of the people I write about--and have great admiration and awe of their talent and spirit and desire to create beauty. Anyone who makes beauty--I admire. Lisa happens to be witty as well and brilliant, a wonderful writer. Thank you, and do stay in touch. ROYALAPOTHIC...wish I was in LA to see your toiletries and frgrances and smell them in person. Love your name and I am sure would love your products as well. Bravo to you. Maryanne-I hope it is now spring were you are. Thanks so much for your kind and lovely message about Lisa...she is endlessly surprising and generous with her ideas and time. Lisa appears to be a woman after my own heart. I adore her style, her wit and her way of getting out her message and passions. I will most definitely be following her incredible blog. Thank you as always Diane to introducing yet another fascinating individual. Thank you so much for your lovely comments. Lisa lifts the spirits of her readers--and I was struck by how many comments on this post noted that she 'lifts us out of the ordinary'. I think that is a fantastic achievement. Thank you, Deborah, for the comment on Tatiana Sorokko. I just spoke to her a few days ago. Her show in Moscow was a great success--and she was totally hoarse from 12-hour days of interviews with the Russian press and tv and other media. Home town girl makes very good. I loved reading about Lisa. After reading your post I feel I really know who she is. What an interesting woman. Your blog is interesting and in-depth. I am a new fan. Wonderful to hear from you, thank you. I love your blog--and as I live not too far from your address, and a hop and a skip from Alta Plaza Park...it is all rather wonderful and witty. Love This!! What a singular and ingenious way to meld such a traditional art form with contemporary humour and whimsy. I love the huge scale, the use of burlap, and the artistry involved. A fabulously irreverent homage to both the past and present. I will make a point of stopping by Lisa's exhibition in LA and her blog! Thanks so much Diane for the great post!